This coffee will be fresh roasted for you. 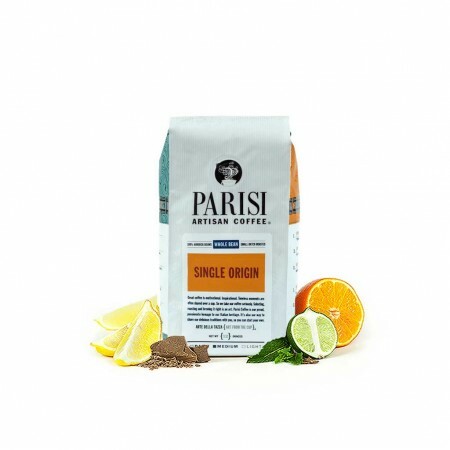 We expect Parisi Artisan Coffee will roast and ship this coffee in 1-2 business days depending on their roasting schedule. The Colombia La Varniza was carefully roasted for you by Parisi Artisan Coffee. This fully washed coffee was grown in the La Varniza region of Colombia. We love this coffee for its nuanced notes of brown sugar and citrus and bright overall quality. I typically enjoy light bright floral, fruity notes. but this one i was not crazy about. Delicious light brew, perhaps the most enjoyed light roast I have brewed myself. I most enjoyed the very smooth delivery, subtle citrus acidity, and clean finish. Acidity high. roast is too light for my tasting. A nice "smooth" morning cup of coffee. Good subtle flavors that came out nicely when brewed in my Chemex, Really enjoy this coffee. This coffee was great. It had a bold flavor that was sweet and tart upfront with a strong bitter coffee after taste. It was awesome. I don't know why I'm not stoked on this coffee. It's a combination of too light and kind of thin body. The citrus aftertaste kind of lingers and I wish it didn't. I think others may like this, but it's not the cup for me. Decent coffee. Call me crazy, but sometimes I run across coffees that have a hint taste of peas/asparagus. This is one of them. This is my first coffee from mistobox. Can't wait to try and compare others. Quick update, this coffee seems to really benefit from degassing, for a v60 I increased my bloom to 80g of water and gave it a really good stir. Seems to bring out the best, really enjoy this coffee very nicely balanced. Really enjoyed this one. Unfortunately didn't write a review while it was in my cup to give tasting notes, but I was very impressed and saved the bag to remember this roaster. This was nice but too lite for my taste. I have tried this coffee before at the Parisi Cafe in Union Station, this time I was dissapointed. The beans were inconsistent and had an overall stale characteristic. It was difficult to extract any of the major flavor notes I look for. Bright with a hint of citrus. Overall flavor is reminiscent of oolong tea. Smooth, so perfect for the first cup in the morning, but somewhat lacking in substance. If a lighter, brighter roast is your thing (it's not mine), then this might be your coffee. I really enjoyed this coffee. The description is very accurate it is bright and very approachable. Tasting Notes: Lime, Soft orange or tangerine, lavendar.Bright, clean mouthfeel with very smooth aftertaste. Can taste a bit green when first brewed. I am enjoying the coffee, but i would also like to try new ones. Overall i am very satisfied. Really liking this coffee! Love the bright yet smooth flavors. I'm tasting peaches and caramel...with no bitter aftertaste. Brewed on a Bonavita 1900. Definitely would drink this again. The coffee was good but a little too much citrus taste for me. I was impressed by this coffee. I first made a chemex and both my wife and I loved it. It was smooth and had rich flavor. I also have. ROK espresso machine. I've pulled a couple of shots in it and it tastes great. Good pick. This coffee is a nice change of pace from what we usually drink, but I likely wouldn't re-purchase.Pros: Loved how fresh the roast was- when making it in a chemex, it has a nice full bloom. The roast was light enough to let the flavors of the beans shine through.Cons: This coffee was very fruit forward- the citrus came through much stronger than the brown sugar. While this isn't necessarily a bad thing if you like fruity coffees, we prefer richer flavors of 'toast, chocolate, caramel' to be the dominate flavor profile. My first coffee from Mistobox! :) I got it today and have brewed twice (hot/iced) with Clever. This coffee is nicely bright with no bitterness. As described, I could taste peach and slight caramel note with light bodied syrupy mouth feel. Quite tart and tangy on the tongue, but somewhat balanced overall. Especially when brewed over ice, it tasted smoother and clearer. The only downside of this coffee was there's not much aroma that stands out on the nose---I wish I could feel more complexed aromatic sensation. Maybe I should try out with some other brewing methods as well? Although I can't tell what flavors and notes are my favorite,(since I randomly like or dislike different kinds of coffee and love to discover new things,) maybe this one is little too bright to be my daily go-to coffee. Floral scent on sniffing the coffee. Notable acidity is balanced with the smooth creamy mouthfeel of the coffee. Tangy notes of citrus and lemon, with some slight herbal scents. Pleasant finish with the acidity slowly ebbing out, leaving a nice aromatic aftertaste.Overall probably still too acidic/bright in my opinion, although this coffee is extremely smooth with a rich mouthfeel that really balances the acidity. Chemex preparation. Definitely got the peach notes up front. Good syrupy mouth feel. Enjoyable flavor profile as the temp comes down as well. Very fragrant and bright with citrus-ey after taste reminiscent of a zesty tea. Too bright for my liking.